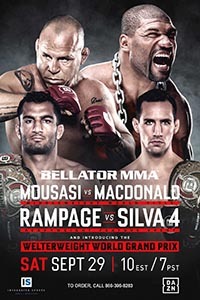 Bellator 206: Mousasi vs. MacDonald took place September 29, 2018 at SAP Center in San Jose, California. • Ignacio Ortiz vs. Jacob Ycaro: Ignacio Ortiz defeats Jacob Ycaro via unanimous decision. • Isaiah Batin-Gonzalez vs. Khai Wu: Isaiah Batin-Gonzalez defeats Khai Wu via split decision. • Gegard Mousasi vs. Rory MacDonald (MW Championship): Gegard Mousasi def. Rory MacDonald via TKO (punches) at 3:23 of Round 2. • Quinton "Rampage" Jackson vs. Wanderlei Silva: Rampage Jackson def. Wanderlei Silva via TKO (punches) at 4:32 of Round 2. • Andrey Koreshkov vs. Douglas Lima (WW Grand Prix Opening Round): Douglas Lima def. Andrey Koreshkov via submission (rear-naked choke) at 3:04 of Round 5. • Leandro Higo vs. Aaron Pico: Aaron Pico def. Leandro Higo via TKO (strikes) at 3:19 of Round 1. • Adam Piccolotti vs. James Terry: Adam Piccolotti def. James Terry via unanimous decision (29-28, 30-27, 30-27). • Arlene Blencowe vs. Amber Leibrock: Arlene Blencowe def. Amber Leibrock via TKO (slam, punches) at 1:23 of Round 3. • Jeremiah Labiano vs. Justin Smitley: Jeremiah Labiano def. Justin Smitley via TKO (punches) at 3:28 of Round 1. • Joe Neal vs. Josh San Diego: Josh San Diego def. Joe Neal via split decision (28-29, 30-27, 29-28). • Anthony Figueroa vs. Samuel Romero: Anthony Figueroa Jr. def. Samuel Romero via unanimous decision (29-27, 28-26, 29-26).